The eight new pickleball courts at Palmetto Dunes Oceanfront Resort are completed and open for recreational play! This expansion brings the total number of courts to 16, all lighted for night play. 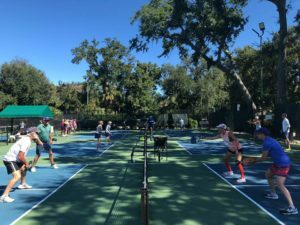 Court reservations are recommended, especially during the morning hours when the Pickleball Center offers instructional clinics and pro-supervised round-robin play. Monthly, quarterly, semiannual and annual memberships in the Palmetto Dunes Pickleball Club are also available. Memberships start at $25 and are highly recommended for individuals, couples and families who play frequently. Depending on the membership period, the cost of clinics and round robins can be discounted by 50 percent or more. There are also member discounts for court rentals and equipment purchases. Our goal at Palmetto Dunes Pickleball Center is to provide a fun, safe and competitive environment for pickleball enthusiasts and beginners alike. Our pro-supervised round robin is the most popular program, where we match players by skill level. Round robins are now also offered in the afternoons on Tuesday, Wednesday and Thursday from 3 to 4:30 p.m., in addition to our daily round robins from 10 a.m. to noon. For competitive pickleball players, we plan to develop an intraclub and interclub league beginning in February. We encourage you to come by and learn more about this sport, our programming and how you can get involved. Check out the comments by fellow pickleball players on TripAdvisor, Yelp or Google by searching Palmetto Dunes Tennis and Pickleball Center. For more information, visit www.PalmettoDunes.com/Activities or call (866) 242-3169.